French gun-maker Louis Debuit’s late-1940s-vintage PM9 was quite unlike almost any other submachine gun. The weapon’s action was a conventional short-recoil mechanism capable of cycling at up to 750 rounds per minute. However, it was the PM9’s method of slowing the bolt that was so unique. The PM9 made use of a “flywheel” bolt — that is to say, the bolt moved backward and was slowed by a piston-like rotating crank. The connector between the crank and bolt traveled vertically as the bolt cycled. The bolt and rotating action resembled a piston and crank in motion. Yes, weird. Debuit originally chambered the PM9 in French 7.65-by-20-millimeter longue, like the earlier MAS-38. However, the manufacturer Merlin Gerin switched this to the nine-millimeter cartridge that had become popular during World War II. Much like its contemporary the Hotchkiss Universal, the PM9 could fold to drastically reduce its size. 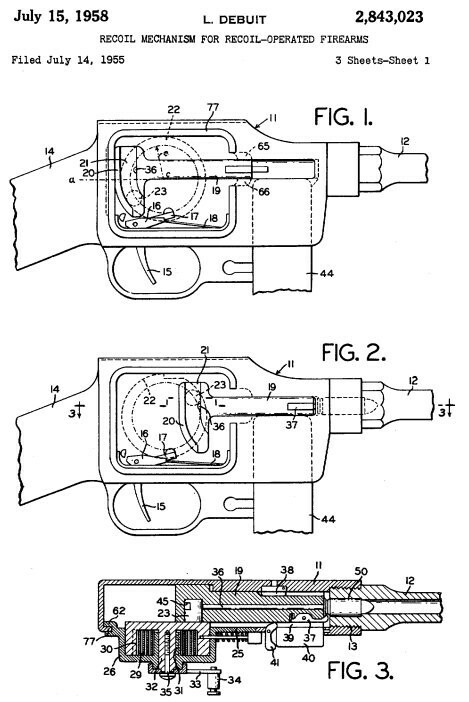 Unlike the Universal, the PM9 had a simple wire stock which flipped to the side, while the magazine housing and magazine folded forward under the barrel. Debuit’s design was not the most ergonomic weapon. But at just 36 centimeters long when folded, it was much smaller than most of its contemporaries, including the Universal. Merlin Gerin produced the PM9 in 1954 and ’55. However, the gun found few buyers and Merlin Gerin eventually sold the license the German ERMA-Werke company in 1956. The Germans patented the PM9 in the United States in 1958 but never actually launched full production of the tiny submachine gun. While the design was novel and the rotating bolt greatly reduced the size of the receiver, the PM9 offered few practical advantages relative to its cost. Today the weapon is all but forgotten.